THz, that's just cotton covered magnet wire if I'm not mistaken. I'd be surprised if it's still available. Temp stable resistances were often wound from Constantan, a wire similar to nichrome. If one will power up it might be a good idea to measure the current and voltage across it and let that guide your choice of replacement resistance wire. 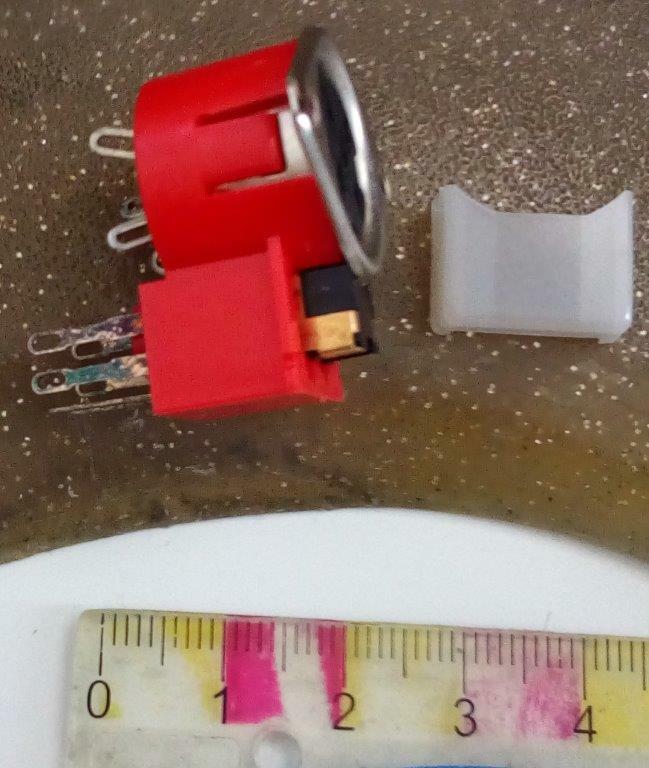 Given what the instrument is, what it probably cost new, and that these resistors range from 500 R to 5K, and that the circuit is a precision resistive bridge to measure glass photodiode current by nulling, I very much doubt they are ordinary magnet wire. Ah! Constantin. Yes, thanks, that's the word I couldn't remember. Next question is whether that wire in any suitable form is still available. Having the keyword helps. Actually due to the circuit arrangement, with stuff unplugged all these resistors have at least one end isolated, so can be measured directly. Determining their values is not a problem. And I guess I can hot air them while measuring, to roughly estimate temp coeff. to see if it's some ordinary wire or something like Constantin. "See if it will power up" - Heh. The entire thing runs on two D cells. Directly. Though the photocell circuit actually has some electronics, the rest is ultra simple. Except for being a tangle of connectors and a multi-pole, multi-position range & mode switch, that makes converting my traced circuit mess into a sensible schematic, non-trivial. I was just given three SCR & inductor modules. Two of the SCRs are marked westinghouse T920100803DW 7526. The third one looks physically identical but is marked PSI 1000 10 MJA 2. The round end contact faces are 44mm dia. I'm hoping to find data sheets, mainly for curiosity. Judging by the medium degree of surface corrosion they are probably quite old, so nothing special specs-wise. Slight bummer: The one I took out of the tensioning frame to clean, the number rubbed off the ceramic with the very first light wipe. It's apparently just black ink on glass-smooth ceramic, as opposed to glaze baked onto the ceramic. Dammit. The datecode on that SCR is 26th week 1975. It's a 1kV, 800A, 250us 200mA version. Given what the instrument is, what it probably cost new, and that these resistors range from 500 R to 5K, and that the circuit is a precision Wien bridge, I very much doubt they are ordinary magnet wire. That's a fascinating data book too, thanks. Wish I could have seen whatever 'thing' these inductor-SCR assembies came out of. It's so typical, that whoever disassembled it just cut off the firing leads short of the original ring lugs. Lazy SOBs. Now, to rig up some kind of test circuit to at least see if they are functional at a small fraction of their rating. The clamping brackets have an interesting integral tension indicator. A thin indicator bar is rigidly attached to one end of a thick spring tensioning bar. As the spring tensioner gets bowed by applied force, notches at the other end of the indicator bar line up with the end of the tensioner bar. 1st pic shows a tensioned set, 2nd pic one with no tension. Edit to add: 3rd pic shows the dome-pivot in the central spacer post. Resulting in equal pressure distribution across the SCR puck faces, regardless of unequal screw-down of the tensioning nuts. 2nd edit: Hmm. There's that date bug in Advanced Renamer utility again. Every now and then it gets the 'date photo taken' wrong. Those pics should all be named 20180706_whatever... Sigh. Bug fix hunting time. So I bought a bag full of old components predominantly out of GDR production. Most of it I could identify but there is this connector I can't make heads or tails of it and what it was used for. 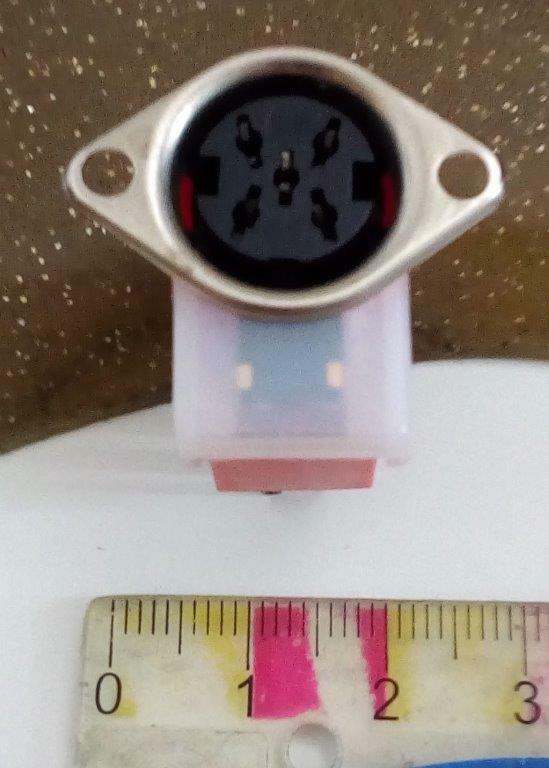 It has a 5-pin DIN style connector on top and another square, spring loaded connector beneath it. 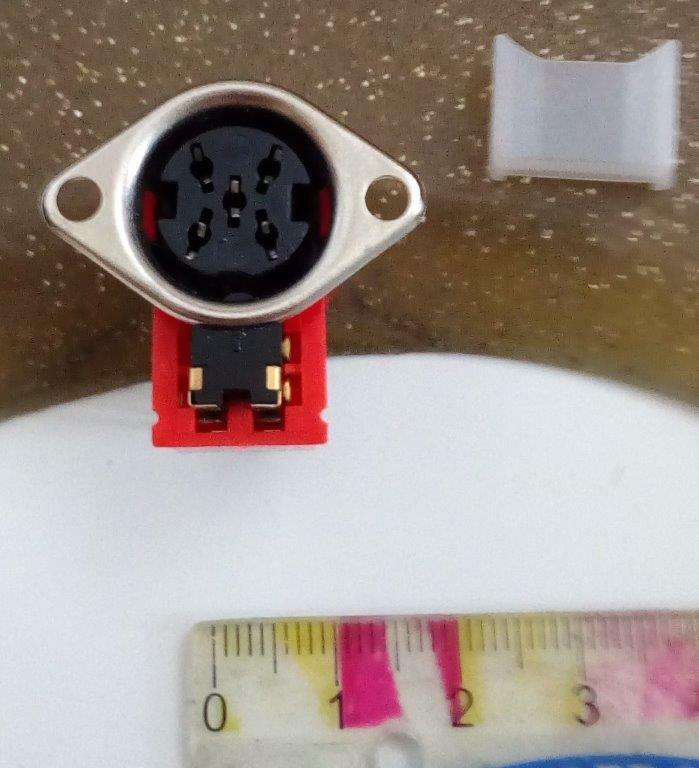 The second connector has a removable plastic cover. The ruler is in centimetres. I don't think the red part is a connector at all. It's more likely a DPDT pushbutton switch. Momentary, unless you tell us it has a latching action. Perhaps it's meant to be used as a lid switch for whatever case it's mounted on? In which case the plastic bit is just a shipping item to keep the parts together. 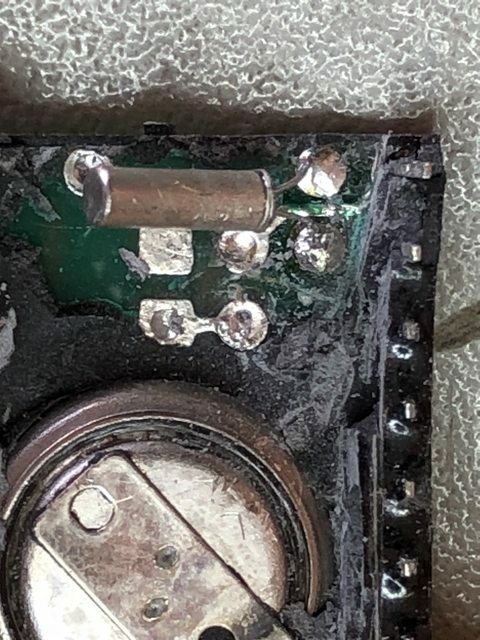 That 5 pin DIN connector was used for headphones (e.g. Philips) some 40 years ago. 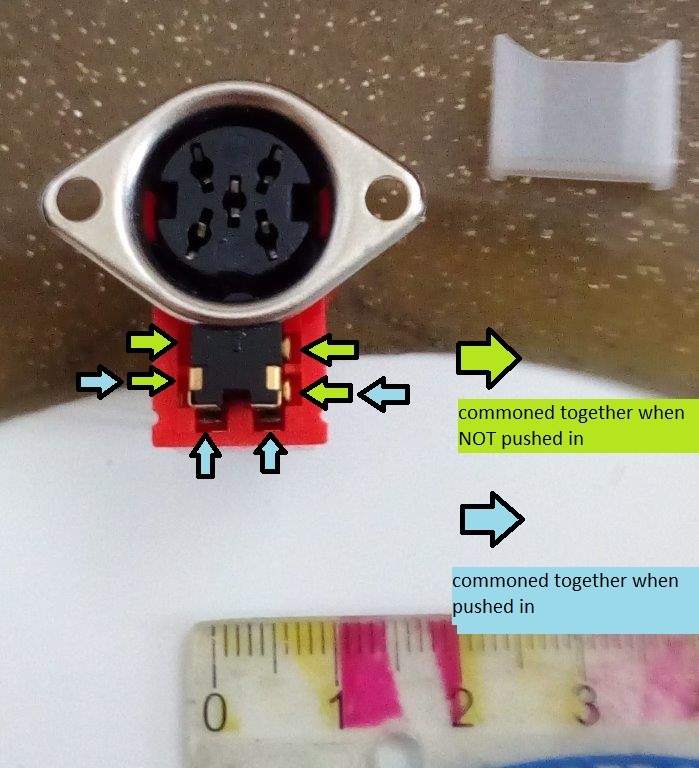 There are always 4 of the six pins of the lower connector commoned together. Which ones depends on if its pushed in or not. It is momentary. 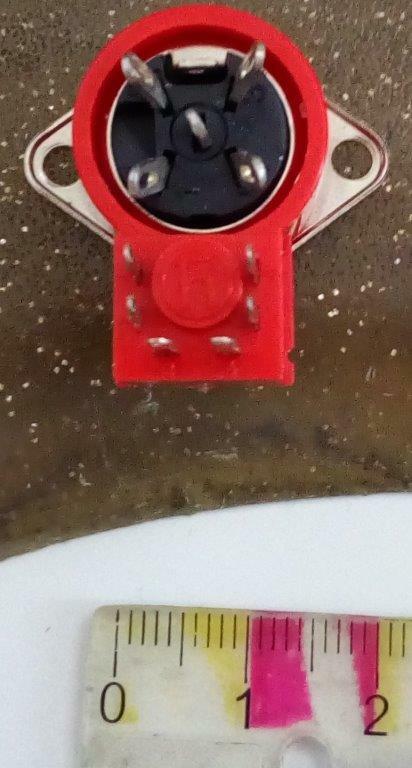 (see picture) Both connectors are positively clipped/moulded into the red plastic casing and is doesn't look like the are meant to be removed from it. I remember these plugs had a little metal square missing on one side, so you could either insert it to switch the speakers off or reversed to keep them on. That makes sense. I actually like the way they did it. It's to be quite robust although switch the speakers on or off that way probably caused a lot of crackling and scratching. I think these are for stereo systems since the left and right side are symmetrical. They are also only commoned together in pair and not all four of them, which kinda makes sense for stereo audio. The Cover seems to be protection only as it doesn't push the switch in far enough to engage it. 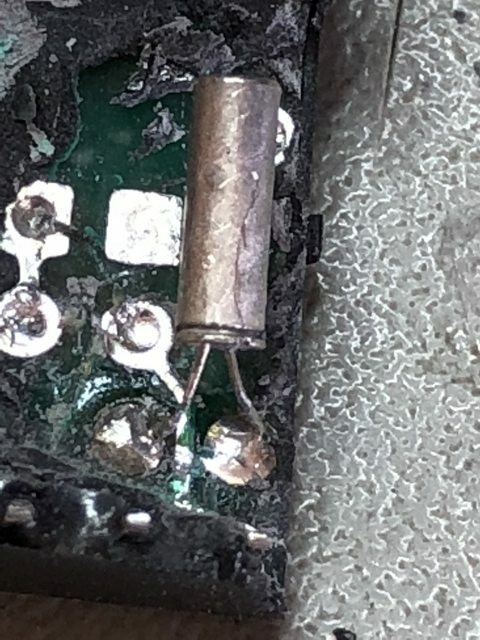 Blew up a chinese 24V to 12V 40A converter (but eventually managed to fix it with unconventional parts - see http://www.quan-diy.com/misc/charger/se460.htm if interested) but is wondering what half bridge driver they were using. It is a DIP8 device marked "3211P", has a single input, high side and low side outputs. Googling doesn't reveal much info most results produced drivers from LT and IR and other random stuff. It is used in a synchronous rectified buck converter with a TL494 doing the PWM duties. So Im completely stumped as to what this part is, mainly because I cant measure it - likely I killed it while extracting the pot from around it with 300c from my heat gun. I assume it's a cap but as it's dead (not even continuity) I cant get any readings out of it at all - to make matters worse, there are no visible marking of any kind anywhere on it. 32.768 kHz crystal for the RTC in that module. Legend, I couldnt find that info anywhere. Cheers, knowing what that is has allowed me to reverse engineer it properly. I remember seeing these in an old Exide model 3180 ferro-resonant 480/277 volt 3 phase 180KW UPS. It was huge, heavy, inefficient and very loud. It was scrapped years ago even though it still worked due to inefficiencies and maintenance of an obsolete system. Maybe the reason you have three of these is that somebody removed them from some old UPS and thought they would get around to playing with them someday [it happens to all of us]. Found a few of these on the dollar cart and had no idea what they were, although the first picture makes me think they might be antennas. Does not look as clean as the genuine part on the site images though. A fractal wifi antenna. Look like a PCB with many many layers. Fascinating. I wonder what an xray would look like. Looks like FR-4 with a top layer and vias to pads on a bottom layer. Do you think there are middle layers? I'd like to cut one up but don't have a lot of tool options. Suggestions? Put it in a toaster oven on high for a long time and maybe it will delaminate.